Flamenco is a collaborative art form with music and dance, started in Northern India and got influenced by Arabic and African cultures, and blossomed in Spain. Flamenco is declared as one of the masterpieces of the Oral and intangible heritage of humanity by UNESCO in 2010. This art form is global and constantly evolving. Flamenco is in the community, not just in big theaters. It's not only for professionals, but also for everyone who loves flamenco: in any age, body shape, gender, ethnicity, background, etc . 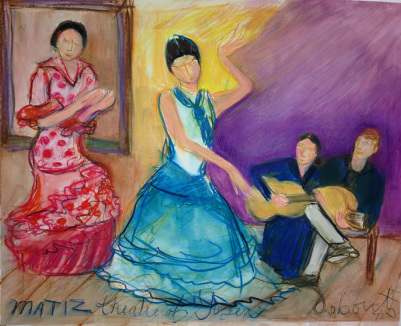 Matiz Flamenco is a unique and inclusive flamenco organization led by Yuli Sayuri. Our missions are (1) to produce authentic and accessible flamenco shows, (2) to offer classes and opportunities to support future performers and aficionados, and (3) to support developing stronger Flamenco community. For booking and information, please contact us at 415-501-0511 or MatizFlamenco@gmail.com. Also, please like us on facebook! Thank you. Flamenco shows for a variety of events in the community: fundraising, entertainment, private parties, and more! Accompaniment Workshop for Guitarists in SF and East Bay. Cuadro performance class (Currently for guitarists. Will extend to dancers and singers soon). Private and semi-private coaching (cante, cajon, palma, and baile) in SF, East Bay, and Peninsula. Class for children. Baile, cante, and more at school and in other settings.